Speechcraft in Vanilla Morrowind is very unpredictable and often quite frustrating, particularly at early levels. A single failed Admire or Intimidate may cause a huge drop in an NPC's disposition, and once an NPC's disposition drops too low, it is almost impossible to bring it up again. Magic users can rely on Charm or Fortify Personality spells to get around this, but the ease of casting these types of spells just makes it more silly that the game is so much more difficult for characters who choose to use natural speechcraft rather than its magical counterparts. 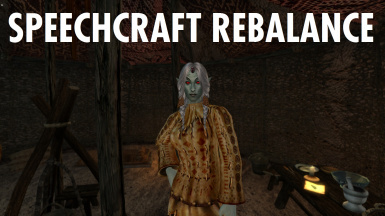 This mod fixes the problem by tweaking a few game settings related to Speechcraft. With this mod, you should succeed at Speechcraft at least half of the time, regardless of the NPC's disposition, but your Speechcraft skill and the corresponding die roll now has a bigger impact on the NPC's disposition change. Characters who take Speechcraft as a Major skill should now be able to effectively use that skill from the start of the game without power leveling, while advancing the skill is still meaningful as it will generally reduce the amount of attempts required to reach a desired disposition level. In vanilla Morrowind, your odds of success could be as low as 5%, but a success would always result in a change in disposition of at least +10. With this mod, your odds of success will always be at least 50%, but the resulting disposition change could be as low as +1. Additionally, the result of any speechcraft action will generally cause a smaller increase/decrease in disposition than before (by about 33%). Installation: Add the .ESP file to Morrowind/Data Files as usual and activate it. This mod should be compatible with any mod, except ones that change the same speechcraft parameters.